This recipe might look a tad familiar to you. Why? Well, once again it’s my Famous Banana Muffin Recipe, transformed just a little but without the bananas! Just replace them with canned cranberry sauce (or fresh cooked if you’ve got it) add in some pumpkin pie spice, and grated lemon zest and voila! Festive Muffin Mania! 🙂 Enjoy! Mix the cranberry sauce, sugar, egg and margarine together. Set aside. In a separate bowl, mix together baking soda, baking powder, salt and flour. Mix wet and dry ingredients all together! Pour into greased muffin tins, and bake in 350 degrees F oven for approximately 20 minutes. Enjoy! *My recipe made about 10 muffins, but you could likely squeeze a dozen small ones out of the batch. 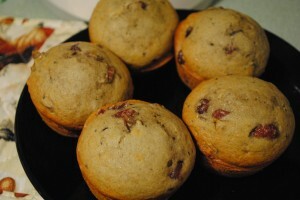 I just made these muffins today with my favorite banana bread recipe. They are great for this season. Cranberry Muffins are in the oven now….Can hardly wait to taste them. Mouth is watering. This is my first try with them. I’m sure that I’ll enjoy them. I like the lemon zest in them. I used half all purpose flour and half whole wheat flour. (sifted) Next time I will use a bit less sugar. They are very tasty. I will make them again. I may add choco chips and nuts next time. What can I say, I LOVE chocolate. I’m baking these right now, and i followed your recipe, but they only rose a little and are really brown and sunk in the middle hmmm, i used cranberry sauce by mine also had whole cranberries in it… im thinking of adding a little more flour. I followed your recipe exactly using the 1/2 cup of sugar. These muffins are delicious. The batter filled my 12 muffin stoneware pan and baked 12 good sized muffins. Thanks for the great recipe. I will make it again. So simple to do. I love this recipe! I substitute orange zest for the lemon zest. Sooo good!